Within the rolling hills of Pennsylvania in the wonderful little town of Hanover sits Conestoga Tile’s discount tile outlet and central distribution center. The discount tile outlet has hundred of great deals. These items must be sold to make room for new arrivals. The products in the discount tile outlet include porcelain tile, ceramic tile, natural stone, glass tile and metal tile. We have hundreds of tile products to sell in the outlet. The public is welcome to visit and purchase discontinued products at discounted prices. 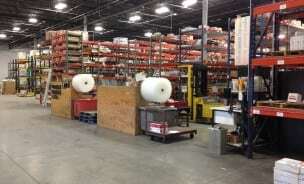 The backbone of Conestoga Tile’s logistics operation is it’s distribution center. This 70,000 sf warehouse serves as the sole inventory and transportation hub. From here, most orders are picked, packed and shipped to our dealers or one of our branch locations. All orders for stocked product placed by 4pm can either be available immediately in Hanover or the following day for pickup at one of our branch locations or on the next regularly scheduled delivery truck to our dealers.